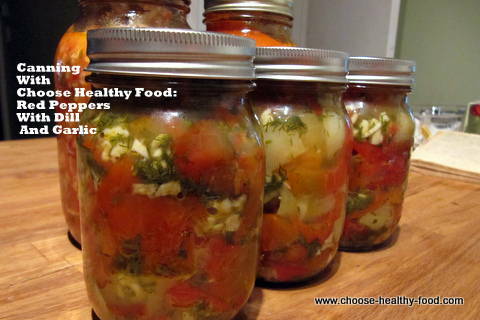 Home Canning Recipes: From Russia With Love. Want to try something new? Try these delicious, traditional Russian and Ukrainian home canning recipes for vegetables, winter salads, ketchups , peppers and tomatoes. Firstly, there are a lot of recipes for canning fruit without sugar ( or adding little sugar). Thirdly, we make them either vinegar free or with much less vinegar than traditionally used in North American canning recipes. Also, many of them are faster and easier as many recipes that dont prescribe sterilization in jars. We use a different trick that I will share with you. Last, but not least, we like to preserve the product so that we just open a can and either add to the food we cook, or eat right away with potatoes, rice, meat, or as an appetizer. In short, not just marinated vegetables, but medleys and salads. I love eating Russian and Ukrainian vegetable preserves. But I hate canning. When I left Ukraine for Canada, I made a promise to never do food preserves ever again. I left my recipes behind. How many falls and summers did I spend canning tomatoes, peppers, eggplants, and whatever else our family could buy or grow. I was experiencing attacks of nostalgia imagining my Christmas table with my favourite grandmas tomatoes and Russian eggplant salad. I could not help myself. Warning: This page is a departure from cooking quick and easy principle that I created this website for. Why subject yourself to the painful process of canning? sharing: I will share these recipes with you, my visitors, who may have not been exposed to the art of canning the Eastern European style. I spent two evenings canning vegetables  and as a result, I am here today to share with you some of the select recipes that I used from the Russian Internet. Use this as a side dish, appetizer, salad, on top of pizza, sandwich, or in soups or stews. I will update you on how this recipe survives the winter. I am a bit suspicious because I, personally, never canned garlic and dill without cooking it for at least 5 minutes. The author claims that this is a well tested recipe though. It looks tastes and smells awesome. So I will keep my fingers crossed and wait for the end of the winter to open the last jar. Wash peppers thoroughly, clean from the seeds and stems, and cut in stripes about ½ inch wide. You can use peppers of different colours for better visual effect. Prepare jars and lids  wash them with soapy water, rinse and start sterilizing. You will need about 7-8 0.5 jars. Wash the dill, shake off extra water, use paper towel to make it even drier, and chop it. You can use coriander, basil, parsley or other herbs of your choice. Prepare marinade. Mix all ingredients in the 3-4 l big pot and boil it. Take portions of peppers and place into the marinade, cover with a lid. Once it starts boiling, set timer to 4 minutes. Boil for 4 minutes. Split garlic mixed with dill into 8 parts. Put layers of the mix and peppers into the jar and cover it with a lid. Pack peppers tightly, so that minimum air is left in between. After you filed all jars, add remaining marinade to them, and finish canning by screwing in the lid. Prepare space to store jars overnight. Cover with blanket or towel, put the jars upside down on the blanket and tightly cover them from all sides and leave for a night or until they cool down. Please stand by for five more recipes. 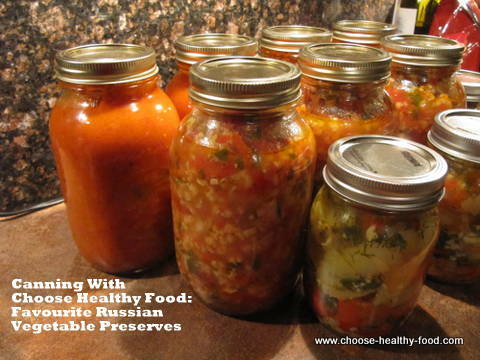 And if you have great home canning recipes to share, why not share them here? Just copy-paste them into the contact form, and I will add them to this page.